(Bloomberg) -- A key measure of U.S. inflation rose less than forecast in March on a drop in apparel prices following a methodology change for data collection, offering some reinforcement for the Federal Reserve’s message of patience on interest rates. The core consumer price index, which excludes food and energy, rose 0.1 percent from the prior month, and 2 percent from a year earlier, according to a Labor Department report Wednesday. Those readings missed both the monthly and annual estimates of economists, while the broader CPI climbed 0.4 percent as forecast and a faster-than-estimated 1.9 percent annually. Yields on 10-year Treasuries fluctuated immediately after the report was released, before moving lower. Wednesday’s numbers likely reflect some effects from new data collected directly from a department store company, which the March report incorporated for the first time. Economists at NatWest Markets Securities Inc., Societe Generale SA and Goldman Sachs Group Inc. had projected the change could cause a drag from apparel on the broader measure. Apparel prices fell 1.9 percent from the prior month, the most since 1949, and were down 2.2 percent from a year earlier. The category accounts for 3.1 percent of CPI. While influenced by technical factors, the softer inflation reading may add to signals the Fed may have longer to wait before price gains firm around their 2 percent objective. A tight labor market has helped boost wages, though policy makers also confront a slowing economy and a weaker global growth outlook. The figures for the broad CPI reflected higher gasoline prices after the rally in crude oil this year. Energy prices rose 3.5 percent from the previous month as gasoline prices advanced 6.5 percent, the most since September 2017. Food costs climbed 0.3 percent. Fed officials, who tend to focus on core inflation as a less-volatile read on underlying trends, have been vexed for years by inflation persistently falling short of their objective. Their preferred gauge -- which is tied to consumption and tends to run slightly below the CPI -- rose 1.4 percent in January from a year earlier as core prices increased 1.8 percent. “Where does this leave the Fed? Very much on hold,” said Stephen Stanley, chief economist at Amherst Pierpont Securities LLC. The change in apparel-price methodology was “flagged to some extent,” and “if the economy rebounds in the spring, it’ll help with firming up inflation and companies will start to be able to raise prices,” he said. A separate Labor Department report Wednesday showed how inflation is affecting consumers’ spending power. Average hourly earnings, adjusted for price changes, rose 1.3 percent in March from a year earlier, following a 1.9 percent gain in February that was the fastest since 2015. 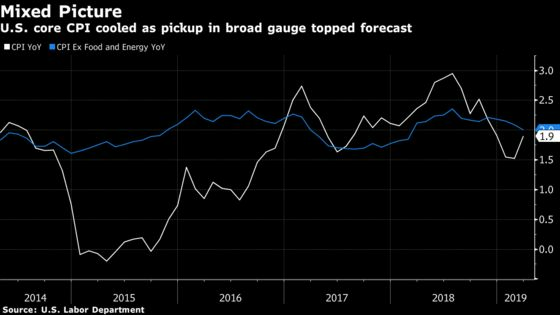 Economists surveyed by Bloomberg had forecast the core gauge would rise 0.2 percent from the prior month and 2.1 percent from a year earlier, while the broader index was projected to rise 0.4 percent monthly and 1.8 percent annually. The report showed used-car prices fell 0.4 percent, the third drop in four months, while new car prices advanced 0.4 percent in the biggest gain since June. Shelter costs, which account for about a third of the CPI, rose 0.4 percent, the most since August 2017, as owners- equivalent rent, one of the categories that tracks rental prices, climbed 0.3 percent. Rent of primary residence rose 0.4 percent.